-Understand the opportunities and available via a personal learning environment and network e.g. own skills development and visualising your own processes. -Understand how a personal learning environment can be utilised in professional teaching. -Personal learning environment and network possibilities and challenges in professional teaching. 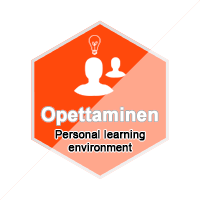 -Describe your current or a planned personal learning environment and/or network using any desired media e.g. video / written document. You may also describe a PLE from the perspective of your students and how they would utilise a PLE. -Also describe with which kind of tools or environments your described PLE will be accomplished. Upload your media e.g. to a cloud service and provide a link in your application.